WEST LAFAYETTE, Ind. 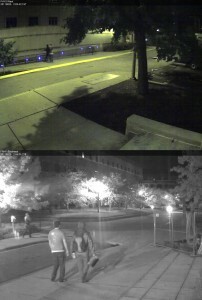 — Purdue University police have released video images of two men they want to question in connection with graffiti found at more than 20 locations around campus. Purdue police Lt. Fred Davis said graffiti was found in places stretching from State Street to Stadium Avenue and from University to Grant streets and on to Northwestern Avenue. The markings are believed to have been done from 1-3 a.m. Thursday (Aug. 25). He said the markings appeared to be done with a stencil and spray paint used to write in “nuclear triad test site” around a triangular symbol. The images show the two men, one of whom appears to be carrying a spray paint can and a rolled-up stencil, on the southeast side of Forney Hall and on the west side of the Physics Building. In one of the images, a third person is shown walking on the other side of the street. Both images were taken shortly after 2:00a. Davis said that person, who appears to be a female, could be a potential witness, and police would also like to speak with her. Anyone with information is asked to call the Purdue Police Department at 765-494-8221 or its anonymous tipline at 765-496-3784. The WeTip anonymous hotline, which is used by all Greater Lafayette law enforcement agencies, also is available at 1-800-78CRIME (1-800-782-7463).